Traditional dental implants are widely regarded as being the ‘gold standard’ for replacing missing teeth, but they are not suitable for everyone. Costs can be high, particularly when multiple implants are required. In some cases, mini dental implants may be a good alternative. They are narrower and cheaper than conventional implants and the process to place them is less invasive. Mini dental implants (MDIs) can range in price from $500 to $1,500 per implant. The cost for an implant supported lower denture with 4-6 implants it typically $2,000 to $5,000. This compares very favorably with full sized implants that can cost from $12,000 to $30,000 when used to stabilize a full denture. These costs are only approximate and can vary according to the following factors. Costs can depend on the type of implant being used as well as the restoration that will be attached to the implant. If you choose to have multiple MDIs placed at the same time, then prices are generally lower compared to having implants inserted at different times. There may be additional costs for diagnostic tests, including x-rays and CT scans that will need to be carried out before surgery so the implant dentist can accurately plan the implant placement. Prices may also vary according to location and are usually higher in large cities. A more experienced implant dentist may charge more for their services. The higher cost associated with a better qualified dentist shouldn’t necessarily be a deterrent as it can be an advantage to choose someone who is more qualified and more experienced to carry out this oral surgery. Insurance may not cover all or part of the cost of MDIs, but many dentists will offer monthly payment plans or will have the details of third-party finance companies that routinely provide loans to cover the cost of dental treatment. dental implant is a prosthetic appliance made from titanium alloy that is highly biocompatible. It consists of an implant post in the form of a screw or cylinder that is inserted into the jawbone after a natural tooth has been removed and which is used to support a replacement tooth. Dental implants may hold a crown, bridge or denture firmly in place. 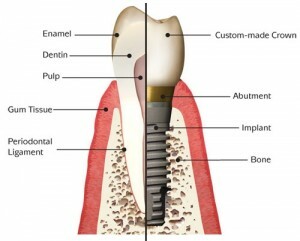 Dental implants have several advantages over other forms of tooth replacement. The implant post acts in a way that is very similar to a natural tooth root, preventing bone loss so the shape and size of the jawbone is maintained. Once the replacement teeth are cemented or screwed onto the implants they cannot move or shift position and should feel as stable as natural teeth. They are ideal for securing loose dentures and can help eliminate problems with sore spots or gagging. dental implants are made from the same medical grade titanium alloy as traditional or conventional sized dental implants, but are much smaller in diameter. MDIs may also be called small diameter implants (SDIs) or narrow body implants (NBIs). After natural teeth are removed, the jawbone will soon lose density and mass. The jawbone can also deteriorate with age or due to osteoporosis. If a person is unable or is unwell enough to undergo bone grafts to build up sufficient bone, then MDIs are a possible solution as they require less bone for placement. Unlike traditional dental implants, MDIs have a screw rather than a post that can be inserted directly through the gum tissues and into the jawbone. There is no need for the implant dentist to open up the gums and no need for sutures so healing is quicker. Although MDIs may seem a good solution, they do have limitations; they do not offer the same level of stability and longevity associated with traditional dental implants that are wider and which are inserted into a greater amount of healthy jawbone. For this reason, MDIs are most frequently used to secure loose lower or upper dentures or to provide stability for partial dentures. When used to stabilize loose dentures, at least four are required to hold a lower denture in place, while up to ten MDIs may be needed to secure a loose upper denture. They can also be used to replace small teeth such as incisors and premolars, or to replace teeth in narrow areas where conventional dental implants would simply be too large. The diameter of MDIs can be between 0.07 to 0.11 inches, or 1.8 to 2.9mm. 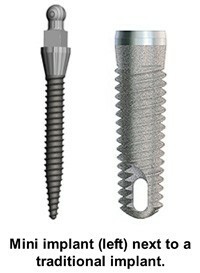 The implant screw comes in 10, 13, 15 and 18mm lengths. This variety enables implant dentists to choose the most appropriate implant for a patient’s jaw size and shape. The overall strength of an implant is determined by its length rather than diameter. This is the main difference between these two systems as traditional implants are typically 4-5mm in diameter and consist of a separate implant post and abutment (the abutment supports the replacement tooth), whereas MDIs are less than 3mm in diameter and are a single unit. Their smaller size makes MDIs ideal for replacing smaller teeth in areas where space is limited as well as for securing full or partial dentures. Traditional sized dental implants are more widely used when replacing larger teeth or for securing a bridge of teeth. Both types of implants are made from high-grade titanium alloy and tests have shown the strength of an implant is due to the length of the post or screw rather than the diameter. Even though MDIs are narrower than traditional implants, the length of the post is comparable to traditional implants. In spite of this, some implant dentists believe MDIs are less able to withstand substantial chewing forces when compared to traditional implants and for this reason traditional or full-sized dental implants tend to be used when replacing molars. With traditional dental implants the dentist must first cut a flap in the gum tissue to expose the jawbone underneath. A small hole is then carefully drilled for the implant. Once the implant is placed, the gum tissue is stitched back in place. Afterwards the implant must be left to heal for several months before it can be restored with the replacement tooth. Sometimes a second procedure is necessary to uncover the implant in preparation for the new tooth. With MDIs, they can be placed straight through the gum tissue and into the bone so there is no need for the gum tissue to be cut and no need for stitches. The implant is in one piece so there is no need for a second procedure. They also avoid the need for bone grafts and the entire process can be faster, less invasive and healing is quicker. Due to their smaller size and the straightforward nature of the surgery to place them, MDIs are more affordable than traditional dental implants. The cost of a mini dental implant can be anywhere from $500 to $1,500, whereas a traditional dental implant costs around $4,000. Traditional dental implants have been widely used for many years and have been extensively studied. A properly placed and well-maintained traditional dental implant has a very high rate of success and can last for decades or even for life. MDIs are a much more recent innovation and fewer studies have been conducted into their success. In spite of this, their benefits and high success rates are becoming more widely recognized and the additional benefits of treatment cannot be ignored. The procedure can be very quick, particularly as some MDIs can be immediately ‘loaded’ with a new prosthesis. This means it’s possible to have the implants inserted and a new temporary denture placed within just a few hours. This denture can be worn while the implants heal and integrate with the bone, enabling a patient to talk and to eat relatively normally. Surgery to place MDIs is less invasive as there is no need for stitches and a much smaller hole is needed for the implant to be inserted into the jawbone. The procedure can be easier to tolerate for anyone who is nervous or anxious. The smaller diameter of the implant reduces the risk of surgical errors where an implant could be placed too near a nerve or sinus. If any damage does occur then it will be easier to correct. Healing is faster and recovery times are shorter due to the minimally invasive surgery required to place MDIs. They can be used in areas where the jawbone may be thinner and where traditional implants would not be suitable without a bone graft. The cost is considerably lower than traditional implants and can be a good solution for anyone looking for affordable dental implants, particularly to secure loose dentures. They have been approved by the FDA for use as a transitional or temporary dental product, as well as for longer-term dental treatments. MDIs still require a good amount of vertical bone as the screws are quite long. This does mean they cannot be used in areas where there is insufficient vertical bone or where there has been considerable bone loss. A greater number of MDIs are required for denture stabilization as the minimum needed for a lower denture is 4 whereas conventional dental implant systems may only require two. They may not be the best solution for the upper jaw where there is usually less bone density. A far greater number of MDIs are needed if they are to be used to stabilize an upper denture, typically between ten and twelve. 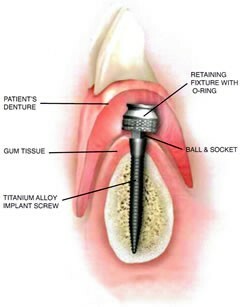 Some MDIs are a single unit, so if the implant head wears down after years of use, the entire implant must be replaced. With traditional dental implants the unit is in two pieces so the head or abutment can be replaced. Have been less widely studied compared to traditional dental implants so there is less data available on their longevity and success rates. MDIs can be placed under local anesthetic and the process can take between 1-2 hours. The procedure for placing MDIs is quite different compared to the procedure for traditional dental implants. It is possible to place and load with new prosthetic teeth on the same day. Prior to beginning the procedure, the implant dentist will have taken detailed dental x-rays to identify the best location for the implants. These images are used during surgery so the dentist can mark the proper location on the gums before they begin drilling. Once the location is identified, the dentist will make a small hole through the gum tissue, using a pilot drill. The MDI is inserted through the hole and is tightened into place using special wrenches and drivers. The top of the implant will protrude above the gums. At this stage the patient’s denture can be measured against the position of the MDIs and is sent to the laboratory to be modified to fit. Once modified, the denture is fitted onto the implants using special O-rings that allow the denture to snap firmly in place. Once surgery is completed the implant dentist may provide antibiotics to prevent infection and might recommend the use of an antibacterial mouthwash. Healing will be faster than for traditional dental implants. During the healing period, patients will generally be provided with a temporary prosthesis to wear. This is to allow the implants time to integrate with the bone so they will be strong enough to support the final prosthesis that can be fabricated at a later date. How Will I Feel on My First Day? Your temporary dentures should feel stable and secure and although you may feel mild discomfort there shouldn’t be any excessive bleeding. You will be able to eat, but it is best to stick to foods that are soft and easy to chew. Your dentist will be able to discuss your diet in greater detail and will tell you when it is safe to reintroduce certain foods. Will I Feel Any Pain after Placement? Any discomfort should be minimal and can be normally be relieved with over-the-counter painkillers, although your dentist can prescribe additional painkillers if required. The discomfort should disappear after the first 48 hours. Yes, as the FDA has granted formal consent for the use of MDIs for long-term dental treatments as well as for the use of transitional or temporary dental procedures. MDIs could potentially last as long as traditional dental implants, but their longevity does rely on expert placement by the implant dentist and continued dental care once the procedure is complete. Any dental implant requires excellent daily oral hygiene to keep it free from infection and regular dental visits for checkups and professional prophylaxis. If you have MDIs, I’d love to hear about your experience! How much did they cost? Were there any complications? Was it painful? Let me know in the comments.